The knowledge propagated in higher educational environments provide students a shared understanding of ideas from multiple fields of knowledge, thus providing an intellectual foundation necessary for a successful professional career. The praxis of knowledge transmission in andragogical settings has been significant advances and adaptations to the needs of twenty-first century learners. However, there is a dearth of studies regarding the development of student competencies and intra-personal skills across cultural boundaries. 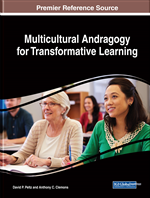 This chapter assesses the implementation of a new methodology that promotes intercultural skills for adult students in higher education environments. Specifically, this chapter evaluates how students perceive interculturality at the university level and how they would foster the development of these particular skills given the opportunity. Results show that learner awareness regarding interculturality increases when provided the opportunity, leading to increased self-consciousness and evidencing their contribution to the development of student interculturality skills. Motivating learners and promoting effective learning activities remains one of the most relevant topics in the field of education. A formative understanding of these topics is essential for discovering how to encourage knowledge acquisition for the varying types of learners that co-exist in the innumerable learning contexts over the world. Today, these contexts and types of learners are noted by researchers to be vastly different from those of previous generations. Specifically, international organizations such as the Organization for Economic Co-operation and Development (OECD), the Center for Curriculum Redesign (CCR), and renowned academic scholars (see Trilling & Fadel, 2009; Bellanca & Brandt, 2010; Bell, 2010; Fadel, 2012; and Beetham & Sharpe, 2013) have published findings regarding the ways that social changes and the exponential evolution of technology has affected learning in the 21st century. An assessment of the findings from these researchers shows significant advancements in understanding the relevant content and best andragogical practices for engaging learners to successfully faceing today’s societal challenges. Within the studies conducted in several OECD countries, methodological conclusions ranged from a need to increase the flexibility available to teachers and professors, to implementing traditional theoretical and practical methods. Their research also finds that the elements required for today’s professionals are interdisciplinary and applicable over several areas of knowledge. “Young people need to collaborate with others from different disciplines and cultures, in a way that solves complex problems and create economic and social value” (OECD, 2016, p. 1); thereby, classifying such skills as the “21st century skills” in their report. This movement of perpetuating an interdisciplinary-based education for learning contemporary skills is manifesting at all levels of education, towards the goal of preparing learners for their character development, successful careers, learning experiences, and for life in general (Fadel, 2012). This has given cause for the OECD to create a Skills division whose motto is, “Building the right skills and turning them into better jobs and better lives” (OECD, 2013). Through this division, OECD intends to evaluate the skills required for 21st century professionals, and to fashion a framework for sharing the best practices in accessing those skills. Among the learning techniques described in the OECD’s report is the mitigation of methods requiring lower-order thinking skills, such as the memorization of textbook facts and formulas. Instead, OECD observes today’s learners as digital natives who need more interactive practices that maximize the use of technological artifacts and concurrent learning engagements that are related to real-life events (Beetham & Sharpe, 2013). Notwithstanding this, there are other factors that shape the professional success of students, many stemming from industries that are increasingly expanding their global footprint through a policy of progressive internationalization. Concurrently, the pace of change incurs a disparity in research pertaining to the implementation and evaluation of the best instructional methodologies to use towards fostering the successful integration of multiple cultures into the redefined workspaces of today. This disparity in multicultural immersion becomes increasingly important as the differences between ethnicities, cultures, languages, sexual orientation, age, and skills become elements that can create conflict in workspaces. Therefore, it is crucial to understand how organizations can instill the skills of interculturality and while also promoting social cohesion in times where the pace of change can outpace readiness.